Established in 1885, the Camden National Bank opened at 259 Kaighn Avenue on August 13, 1885. Zophar C. Howell was the first President. 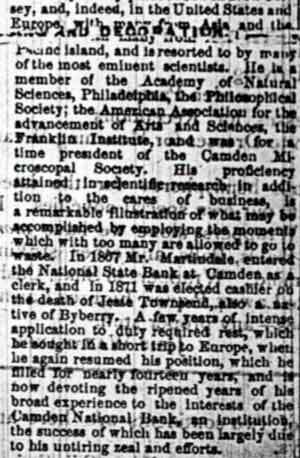 One of the founders, and an early vice-president was Henry B. Wilson, for whom the H.B. Wilson School at South 9th & Florence Street is named, and whose son was Admiral Henry Braid Wilson Jr., for whom the boulevard is named. 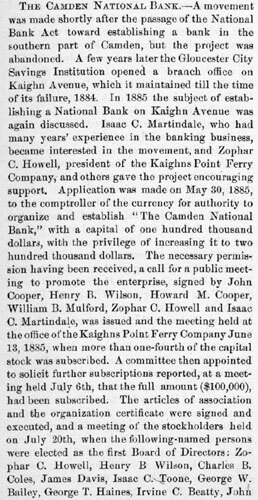 Another of Wilson's son, Philip Wilson, worked for the bank for many years. 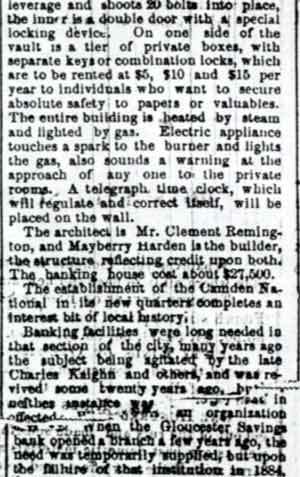 Other founders included Howard M. Cooper and Isaac C. Toone. 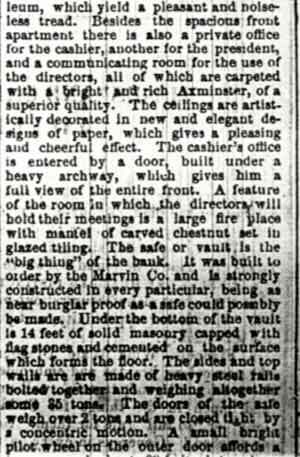 The brick bank building at 2nd and Kaighn Avenue was opened in July of 1887. 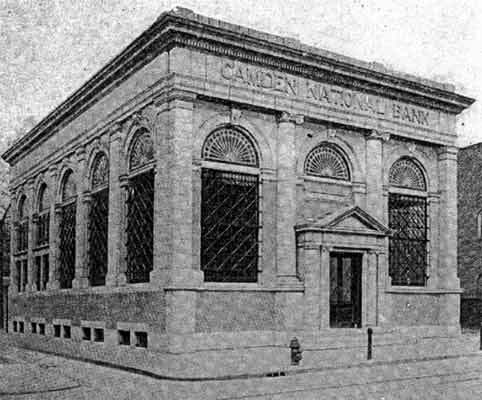 The bank removed to its new building at Broadway and Sycamore Street in 1906. 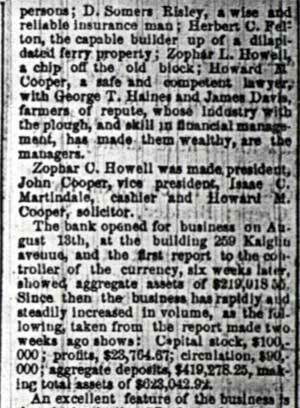 During the 1910s and up to at least 1926, the bank's President was Francis C. Howell. 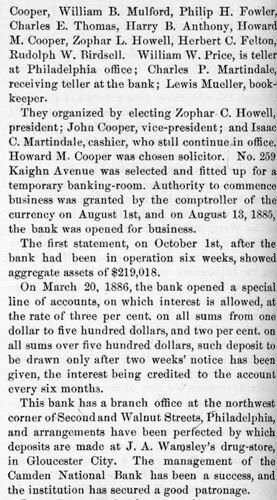 In that year its solicitor was Charles A. Wolverton, who would be elected to Congress the following year, and serve until 1959. 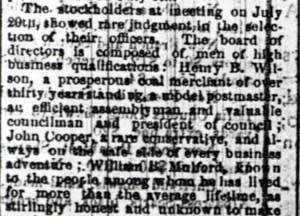 Directors included Wolverton, Dr. John W. Donges, and William Leonard Hurley, the owner of Hurley's Department Store. 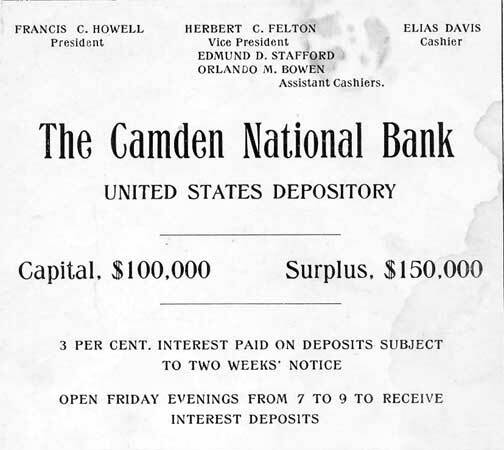 Edmund Stafford and Orlando Bowen had joined the bank as assistant cashiers by 1919. 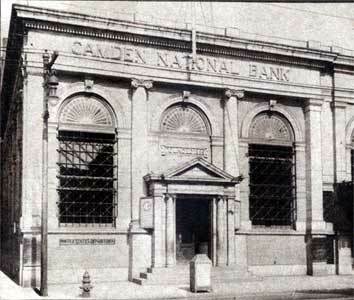 The Camden National Bank merged with the First Camden National Bank and Trust Company whose main office was at Broadway & Cooper Street, on July 1, 1927. 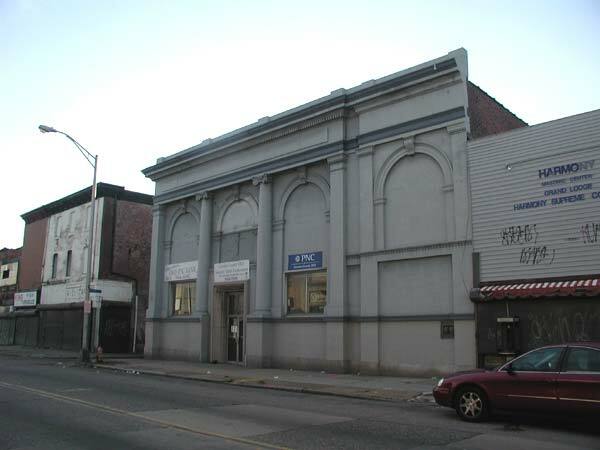 The building at Broadway and Sycamore Street remained open as a branch for many years, and was added to the National Register of Historic Places in 1990. SECOND STREET AND KAIGHN AVENUE. 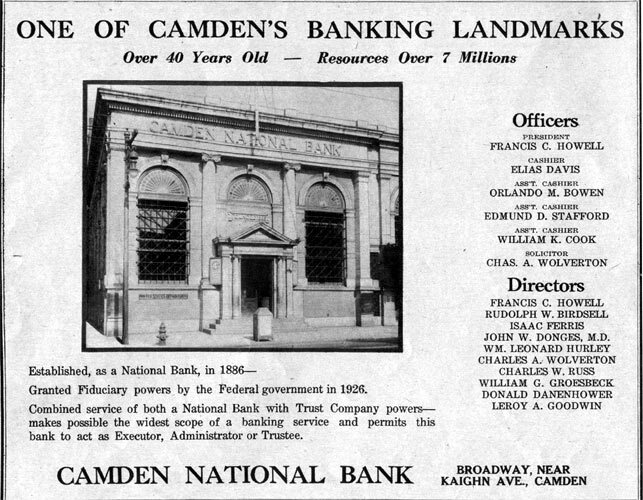 ONE of the chief elements in the material growth and progress of a community is the banking interest, and in this department of business, Camden boasts of several vigorous corporations, one of the most important being the Camden National Bank, located at Second street and Kaighn avenue. 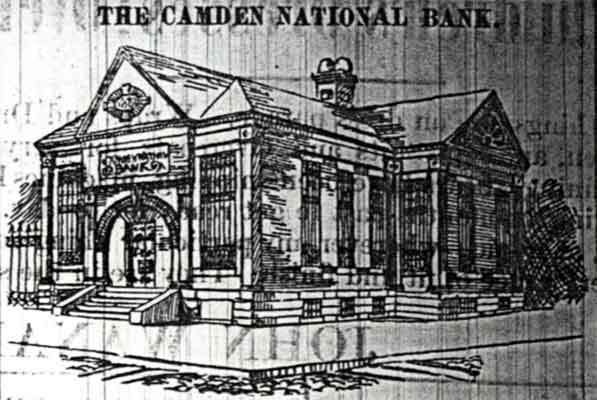 It was incorporated as a national bank in 1885, in order to provide for the needs of the merchants of South Camden, and though so young an institution, it is a remarkably successful one and from the date of its commencement, has enjoyed a large and liberal patronage including all the leading business houses of that enterprising and growing section of the city. 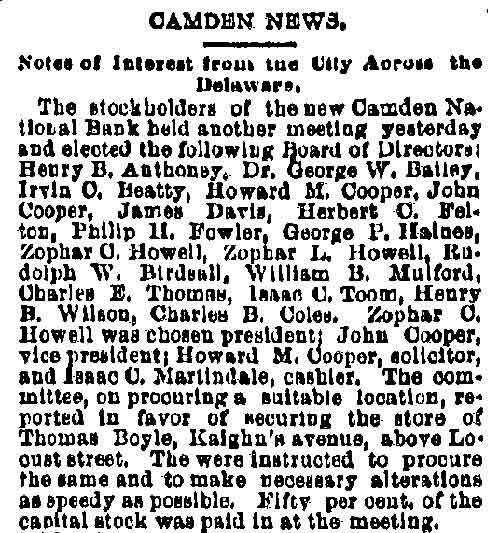 It is a strong and reliable institution, holding a prominent place in, and exerting an active influence upon, the financial condition of the city. 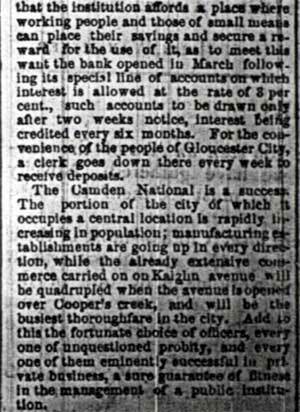 The capital is $100,000, and the surplus already reaches $25,000, and the dividends are six per cent, per annum. 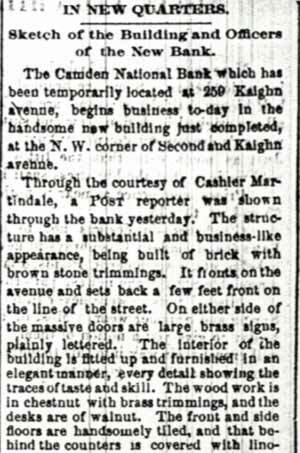 Since the organization of the bank, a handsome, modern new banking-house has been erected, into which the business was removed in 1888, and which is a prominent and elegant feature of Kaighn avenue. 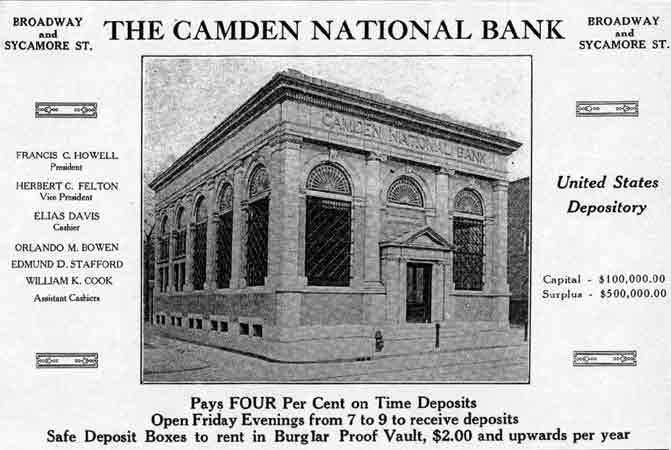 There are safe deposit boxes to rent in burglar proof vaults, while an element of saving fund banking is added by receiving small deposits from working people, subject to withdrawal on two week's notice, and allowing interest thereon. by the last statement, recently issued, which gives total resources amounting to more than $805,000. 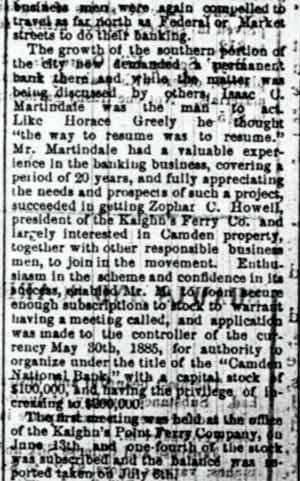 The officers are: President, Mr. Zophar C. Howell; vice-president, Mr. John Cooper; and cashier, Mr. J.C. Martindale. The directorate is composed of prominent gentlemen of substantial position. They are Messrs. H.B. 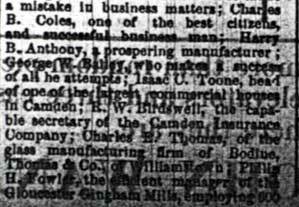 Wilson, William B. Mulford, C. B. Coles, P. H. Fowler, James Davis, C. E. Thomas, Isaac C. Toone, H. B. Anthony, G. W. Bailey, Howard M. Cooper, G. T. Haines, Z.L. Howell, H. C. Felton, R. W. Birdsell and D.S. Risley. 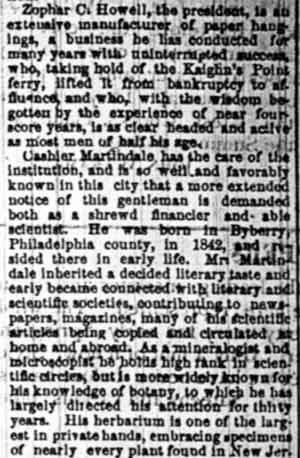 The bank also has an office at Second and Walnut streets, Philadelphia.